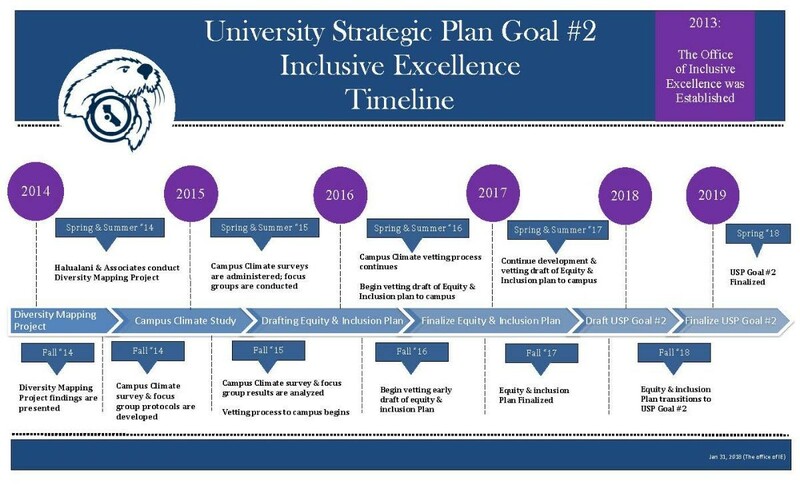 The University Strategic Planning Committee and the President’s Committee on Equity and Inclusion have been working on a campus inclusive excellence plan (“The University Strategic Plan Goal #2: Inclusive Excellence”). The Inclusive Excellence Plan is one of four goals within the University Strategic Plan. This plan is informed by findings from the Diversity Mapping Project and the Campus Climate Study. The plan has four strategies: 1) The university shall be proactive and responsive to the needs of diverse students, faculty, and staff; 2) The university shall support the development and professional growth of faculty and staff in a diverse work environment; 3) The outreach, recruitment, and retention of faculty, staff, and administrators shall reflect the diversity of the student body and the broader communities we serve; and 4) The university will commit to ensuring that graduating students are able to engage in ethical reasoning and public action that is informed by historical, multicultural, global, ecological, and equity-oriented perspectives. The timeline is for the plan to be finalized by spring 2019. We invite you to review the plan and provide feedback to us! Halualani & Associates conducts a Diversity Mapping Project at CSUMB. The Diversity Mapping Project findings are presented. Campus Climate survey and focus group protocols are developed. Campus Climate surveys are administered; focus groups for students, faculty, and staff are conducted. Campus Climate survey vetting process continues. We are committed to making digital content accessible to individuals with disabilities. If you cannot access any of the materials above, please contact CSUMB Office of Inclusive Excellence by phone at (831) 582-3366 or email bortiz@csumb.edu for an alternative accommodation.